A Dutch photographer is trying to capture the unique relationship between Hong Kong shop owners and their cats. Many of the cats were bought to control pests, but over the years they have become a much loved part of the city's identity. A black cat sits outside a Hong Kong grocery store. It's not a stray, but a much loved employee tasked with keeping pests at bay. It's one of many cats catching the attention of Dutch photographer Marcel Heijnen. He's on a mission to capture a piece of vanishing Hong Kong heritage through his photographs of cats outside local shops. The 52 year old moved to Hong Kong a year ago and immediately noticed that almost every shop in his neighbourhood on Hong Kong island has at least one cat living on the premises. Heijnen received a huge online following, after he took a few photographs of his feline neighbours and posted them on social media. A Dutch photographer is trying to capture the unique relationship between Hong Kong shop owners and their cats. The popularity of his photos combined with his own love for cats, prompted him to start a photography book project. But Heijnen says his book project is more than just about cats. "But it wouldn't be enough for me as a photographer to start featuring that. It was more the context and combination with the cats, one doesn't go without the other. I think they are both equally important. It's the cats specifically in that type of store situation that it gets a little bit, it's a traditional store for starter, it's also quite interesting, chaotic and messy and timeless in a way, I thought it was quite interesting to have a cat sitting in the midst of all that. And I was surprised how many of these cats are in stores," He said. Heijnen was surprised by the vast amount of cats in the old shops and the popularity of these feline residents in his neighbourhood, Sai Ying Pun. For the shop owners though, the cats fill both a practical and emotional need.Some shops need them to catch mice while others just simply enjoy their companionship. Heijnen also enjoys the playfulness of his feline neighbours. One of his favourites is "Dau Ding". 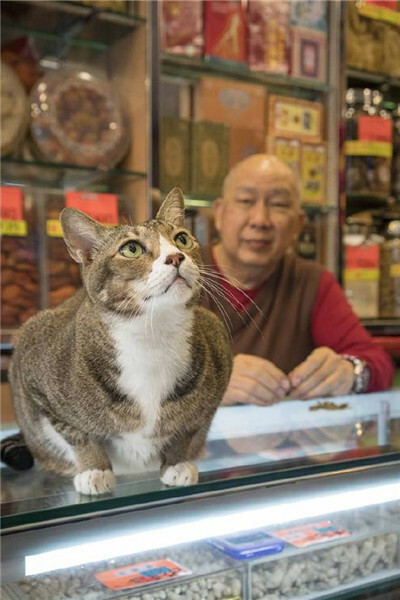 The 13 year old male cat's owner is Mr. Lam who owns a Chinese herb medicine shop. Heijnen says he has a soft spot for "Dau Ding" - which means the tiny one - because he was the first cat that he spotted living near his home. "Dau Ding" was also his first photography subject. He and Mr. Lam are on the cover of Heijnan's new photography book titled "Hong Kong Shop Cats". Some of the photos from this recently launched photography book are on display in a Hong Kong exhibit. A central theme in many of Heijnen's photographs is the visual illusion of the cat blending into the shop surroundings. In some photographs there is a clear view of the cat, while in others they almost disappear into the busy background. Heijnen wanted his book to also capture a little bit of old Hong Kong before gentrification changes the neighborhood. For now, it looks like these feline residents will continue to thrive in this cat friendly neighbourhood.